When does jewelry become art? Is important jewelry made only with precious metals and gems? How does jewelry transform the wearer? These and other questions were explored as Mary Galbraith visited with Jo Ellen Lee and Elaine Unzicker. Jo Ellen earned a Ph.D. in Medical Genetics and worked for many years in genetics laboratories in the southwest. She took up beading in 1993 and it was soon evident that her precise, careful work and superb color sense took her beaded art pieces and jewelry to high levels of excellence. Elaine, a member of the Ojai Studio Artists, holds a Bachelor’s degree in Fine Arts, Master of Science in Art and Master of Fine Art. Her specialty is working with chain mail, a material that is tantalizingly soft and hard at the same time. 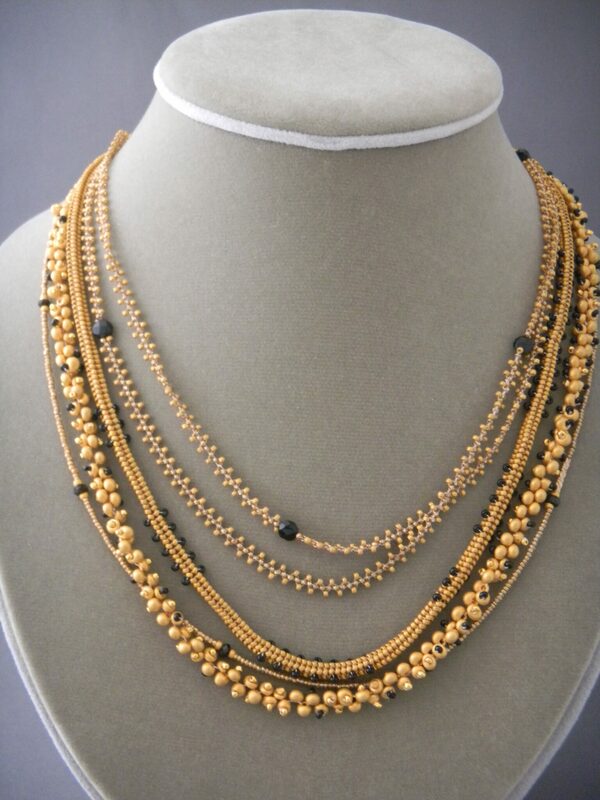 Traditional jewelry pieces such as earrings, chokers and bracelets form but a part of her work. The clothing pieces she designs are truly wearable art: unique, stylish and definitely cool (in all senses). Unziker’s documentation was sponsored by Meg and Jim Easton. The AfterGlow was hosted by The Old Broad Catering Company. The FOTM archive has extensive information about this artist.